When choosing a VoIP service for your small business there are 2 core considerations to keep your eye on; first is the quality of service and the second is scalability. In regards to price, another key deciding factor, you can expect to pay between $15-$25 per month per phone line with baseline VoIP features. Each of the business VoIP providers on the below list are top-quality, scalable, and offer good prices. So, all that’s left for you to consider is which one is the best fit for your business. Vonage is an industry leader that made its name as a powerhouse in the residential VoIP market. Today more than 2.5 million homes and businesses use Vonage. The company has possibly the most extensive infrastructure of any VoIP provider, so customers can expect a reliable and seamless experience. Vonage’s Business Cloud products, for small- and medium-sized businesses, include unlimited calls and SMSs throughout the US and Canada. And if things go sideways for some reason, Vonage’s 24/7 customer support team is based in the US—just another example of the company’s commitment to clear communication. The Mobile Plan, the lowest priced plan, gives you access to more than 40 features including an admin portal, call logs, team messaging, and virtual receptionist for a surprisingly low price. And the virtual extension service allows users to receive calls to mobile devices, which is a big convenience for small businesses that need to be mobile and versatile. The Premium Plan includes everything from the mobile plan, along with: unlimited video chat, conferencing, and file sharing, plus CRM integrations such as Salesforce, G Suite, Office 365, Clio, and Zoho. In addition, businesses can select from around a dozen paid add-ons including virtual mailbox and paperless fax to help them be more mobile and versatile. For more detailed information about Vonage Business VoIP services see our detailed Vonage review, or visit Vonage’s website. RingCentral is one of the largest VoIP providers, and while the company is more geared towards medium and large businesses, it’s also a great VoIP service for small businesses to grow with. Even with the Essentials and Standard Plans–the cheapest offered by the company–users receive impressive functionality including: unlimited video conferencing with screen sharing for up to 4 users, call screening, call logs, advanced call forwarding, integration with Microsoft and Google, and integration with mobile devices so employees can access company calls from anywhere. The Premium Plan offers an even more robust set of features. 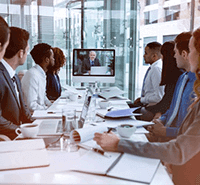 With Premium you get video conferencing for up to 100 users, 2,500 toll-free minutes, voicemail transcription to text, and a more sophisticated set of integrations such as Salesforce and Zendesk. For more detailed information about RingCentral Business VoIP services see our detailed RingCentral review, or visit RingCentral’s website. Jive may have a funny name, but the features and options the company offers are nothing to laugh at. While other VoIP providers offer basic packages and then charge extra for add-ons, Jive works the opposite way: it offers all its small business customers unlimited access to 80+ features and bills them based on the number of users. This pricing method makes it particularly cost-effective for small businesses who have use for enterprise-level features for a low price. This all-inclusive package comprises many features that customers of other VoIP providers must pay for separately, such as a conference bridge which allows you to host conference calls with up to 10 attendees; and fax-to-email and voicemail-to-email functions. For more detailed information about Jive’s Business VoIP services see our detailed Jive review, or visit Jive’s website. 8x8 is an industry leader in cloud-based VoIP options for businesses, and has some of the best uptime and call quality available. Uniquely, 8x8’s pricing isn’t determined by the number of users but rather the level of features and functionality. In addition, 8x8 has some of the best software integration of any VoIP provider. More than 30 digital office tools can be integrated with 8x8—including Salesforce, Zendesk, and Netsuite—meaning you should easily find a tool that can help your small business. The X2 and X5 packages provide all the basic functionality your small business needs, with the main difference being that the X5 offers free calls to more countries (32) and more media storage (5GB). The X8 introduces a virtual contact center that’s more suited to medium or large businesses—so if you’re a small business with big plans, it’s good to know what 8x8 is capable of for the long haul. For more detailed information about 8x8 Business VoIP services see our detailed 8x8 review, or visit the 8x8 website. Grasshopper is a VoIP that isn’t trying to compete with the big boys, and focuses instead on small businesses and their unique needs. Luckily for small businesses, Grasshopper doesn’t require the purchase of any new hardware and works directly off your iPhone or Android phone. This is great for small businesses looking to keep their operating costs low. Grasshopper also prides itself on being a service that is easy to set up and operate with no tech training, and with 24/7 customer service to give you a hand if needed. One place where Grasshopper falls short is in terms of features and integrations. Unlike the other companies on this list, Grasshopper doesn’t cater to enterprise businesses, nor does it offer as extensive a list of features or integrations as the competition. Nonetheless, Grasshopper is a very solid option for small companies that want to help cut their costs with a VoIP service, and make leaps and bounds that are surprising for their small size (much like a grasshopper, get it?). For more detailed information about Grasshopper Business VoIP services see our detailed Grasshopper review, or visit the Grasshopper website. One of the biggest challenges for any small business is keeping operational costs low, and a VoIP service is a sure-fire way of saving on phone bills. 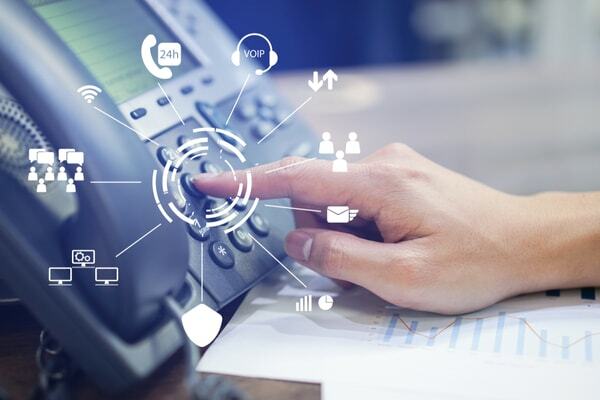 What’s more, the best VoIP providers offer stacks of features you won’t find with traditional landlines, such as third-party integrations and the ability for employees to use their cell phone with their office number. Before committing to one of the top VoIP providers, shop around to see who offers the features you’ve identified that can boost your bottom line for the lowest price per user per month. Also, don’t forget to take advantage of free trial periods and no-obligation contracts that let you test run your VoIP service before committing in the long term. Once you’re up and running with a VoIP system, you’ll wonder why you ever hooked your small business up to an outdated landline system in the first place! The Top10 Business VoIP staff is comprised of professionals with a vast knowledge across the world of voice over IP technology and companies. Members of our international team have extensive first-hand online experience in utilizing strategies for supporting businesses with VoIP and copywriting and editing for various online and print publications.